The Brazilian phrase "É boa pra caramba" may be the best way to describe its economic miracle. Within the lifespan of most of its residents, the country has faced significant economic turmoil, survived a military dictatorship and grew its gross domestic product (GDP) from $15 billion in 1960 to the world's seventh largest economy breaking $2 trillion in 2011. That's "surprising" by anyone's standards. Since 2003, Brazil has improved its macroeconomic stability, built up its foreign reserves and reduced its debt by converting it to real-denominated and domestic securities. Then, in 2008, the country's debt was awarded investment grade status by two credit agencies. After a moderate recession, the country returned to positive growth in 2010 and continued to be an attractive destination for investors. The economy struggled in 2016, however, with the slide in commodities. International investors know Brazil best for its rich natural resources. In addition to its extensive offshore oil fields, the country is the second largest producer of iron-ore in the world and produces more ethanol than Asia and Europe combined. These resources help it cheaply produce a wide variety of industrial and consumer goods while serving as a key raw material supplier to countries like China. The country's negative GDP growth rate and high unemployment rate reflect the significant slide in commodity prices throughout 2015 and 2016. With China's economic slowdown, there are concerns that the commodity weakness could persist, which has led to the shutdown of major projects. The country's close ties with commodities mean that its economy largely depends on these prices. 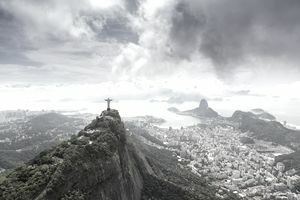 Like most emerging markets, investing in Brazil involves a trade-off between risk and reward. The country's high growth rates may produce strong past returns, but political instability and commodity-dependence make it riskier than developed markets. Over the past ten years, the MSCI Brazil Index has underperformed the S&P 500 by roughly 100%, although it was outperforming by a wide margin until mid-2013 - highlighting its dependence on commodity prices. Commodity-Rich. Brazil's economic growth has benefited from strong demand in China and other emerging markets for its natural resources, although these factors have led to some significant declines in more recent years. Relatively Stable Economy. After taking steps towards fiscal stability and liberalizing its economy in the 1990s, Brazil has become a top-tier economy with a growing technological sector and an inward focus that should reduce commodity dependence. Rich in Natural Resources. Brazil is the second largest producer of iron-ore in the world and home to one of the largest offshore oil discoveries in decades. This has helped it build a base from which it can grow its internal sectors of the economy. Political Instability. Brazil has a somewhat volatile political history that remains persistent even today. In 2015 and 2016, many officials have been tied to criminal activities in conjunction with the partially state-owned oil giant Petrobras. Foreign Dependence. Brazil is more dependent on exports than developed countries like the United States, while it also relies heavily on external financing and its current account deficit. The commodity downturn has taken a toll on the economy as a result. There are many different ways to invest in Brazil, ranging from U.S.-listed exchange-traded funds (ETFs) to securities listed on its own stock exchange, the MB&F Bovespa. ETFs represent the easiest way to gain exposure without worrying about American Depository Receipts (ADRs) and domestic securities. International investors looking for direct exposure can purchase Brazilian securities directly through many global trading platforms with access to the MB&F Bovespa. Those looking to invest directly need to engage local entities to act as custodians on brokerage accounts and register with the Brazilian Central Bank and other regulatory and tax agencies. The most popular index on the MB&F Bovespa is the Bovespa Index (IBovespa) which accounts for about 80% of trading volume and 70% of the exchange's total market capitalization. Brazil is one of the world's fastest-growing countries and a member of the so-called BRIC nations, but it also has several risks embedded in its politics and foreign dependence. Those looking for an easy way to invest in Brazil should look at ETFs and ADRs, while those looking for more direct access can open a foreign brokerage account and trade on the MB&F Bovespa.